Contact lens solution "is essential"
People who wear reusable contact lenses should never be tempted to use any form of liquid other than contact lens solution to clean the products, it has been advised. 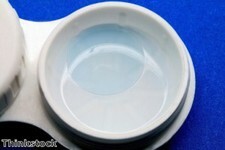 According to the health advice site Newsolio.com, it can be tempting to use water to clean the lenses, but because tap water and even mineral water has tiny bacteria in it that can harm the eyes, only contact lens solution should be used to clean the products or store them. "No matter what type of lenses you have, they will still become coated with proteins over time. Cleaning solutions should remove this protein build-up, but they're not always 100 per cent effective," the source explained. The site added that, in order to reduce eye irritation, people should always keep their lenses in some form of solution when not in the eyes, as this substantially reduces the chances of an infection occurring and provides peace of mind. "Nowadays, you're more likely to use an all-in-one cleaning solution that makes enzyming and rubbing obsolete," it explained. Alternatively, if the contacts dry out while in the eyes, only use solutions designed specifically for re-wetting, the source recommended. The site also noted that certain commercial eye drops are not intended for contact lenses and may irritate rather than soothe, so it is best to always check with an expert or eye specialist before using them, and carefully read the label. Recently, Dr Shahzad Mian, a cornea specialist at the University of Michigan's Kellogg Eye Center, said that one of the key mistakes among contact lens wearers is not cleaning them properly. He explained that it is "critical" to wash your hands first, then clean your contacts according to the directions issued by the manufacturer - which always means using the right type of contact lens solution.